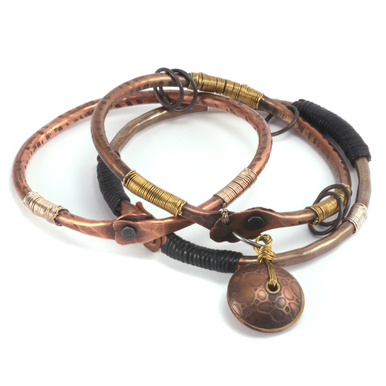 In this quick and easy class, instructor Lisa Niven Kelly shows you how to create your very own bangles. 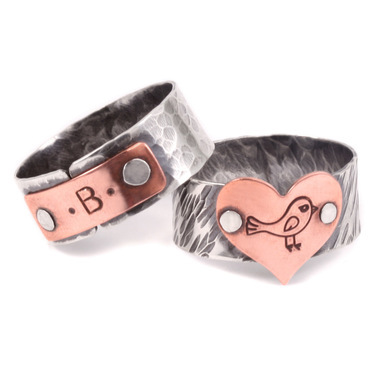 You will learn to measure, forge, shape, and rivet together these fashionable bangles. Once you make one, you'll want to make a million! This class is great for beginners. This class has a run time of 19 minutes. just finished watching this at my work. Now I cannot wait to do this. Just need to order some things to get started. I love watching your videos. The steps are awesome to follow. Thank you Lisa. Your video on the riveted bangle bracelet was so clear, well paced, relaxed & full of great tips! Every class I've taken is amazing. Everything is explained extremely well, which makes each project very attainable. My opinion is that these are some of the best classes available. I would recommend them to anyone. Thank you Lisa and staff for your expertise and your willingness to teach and share. Thanks again for sharing some special tips to make this work easier. I love the fact you and the rest of your staff are willing to share how to make different projects! Great instructional video. I am so excited to purchase what I need to make bangle bracelets. Lisa is such a good teacher she makes it not seem intimidating to learn more techniques. Thank you so much Lisa! Some great tips, thanks. If you want to make sure the measurement is right, before you punch the second rivet hole, measure again from the first hole, and use a sharpie to mark where the second rivet hole should be punched. That way you will never end up with a bangle that is too small. Sharpie marks come off with a cotton swab and bit of rubbing alcohol. Thank you, Lisa. This is a great beginners project. You were thorough with the step-by-step directions; making it easy for a beginner to follow each step. It provides them an outlet to make some great bangles and have a sense of accomplishment. Beaducation is a great company and proactive with upcoming information about this industry. Beaducation is one of the first websites I go to when shopping or wanting to learn something new. Very informative video! Great info on tool usage and basic riveting! Thank you, Lisa! Fantastic video. Easy to follow, easy to understand, easy to see everything you're doing. I can't wait to get started on these! I can't wait to try this!!! My little pea brain is positively swimming with ideas!!! Thanks again for a very informative tutorial! This is such a wonderful tutorial. I watched it all the way through and then watched each step as I made my first rivet bangle. I am now totally hooked! I want to rivet all the things!